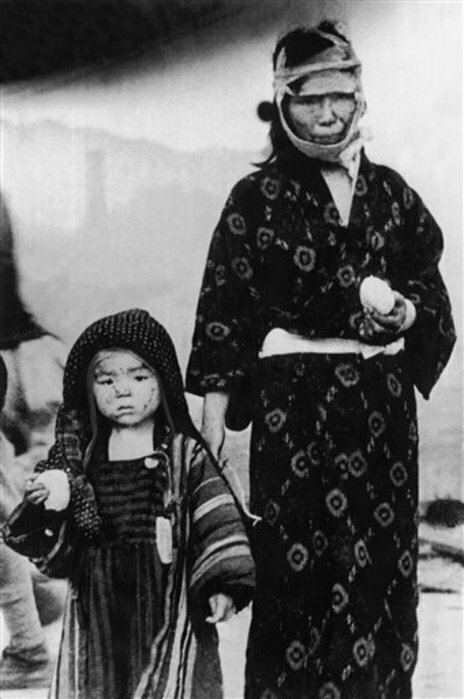 In the first weeks after the atomic bombings. 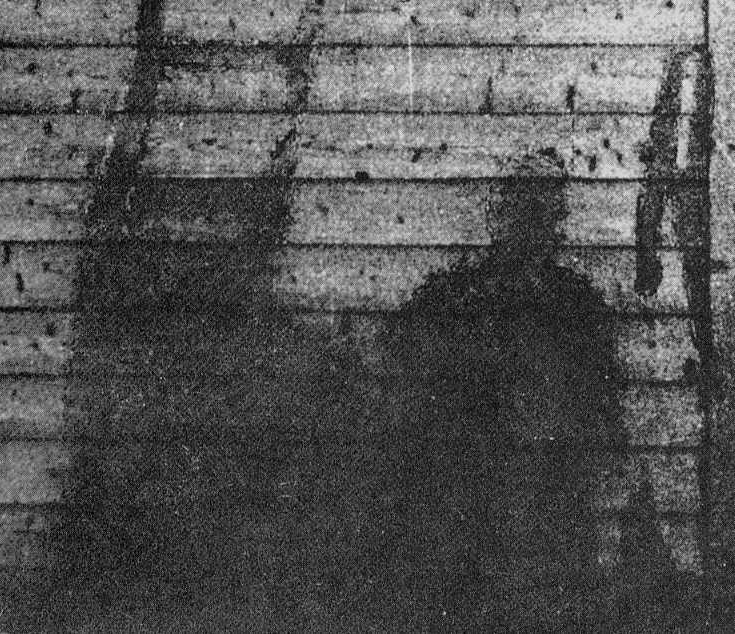 Americans and others were exposed in print to only a few stock images: the mushroom cloud over one of the two Japanese cities or from the Trinity test, Hiroshima from a surveillance plane high overhead, a limited view of one largely destroyed area of Hiroshima--plus the crew of the “Enola Gay” or drawings of how the new weapon worked. No Japanese victims appeared. TIME magazine would picture a smiling Einstein next to a mushroom cloud. 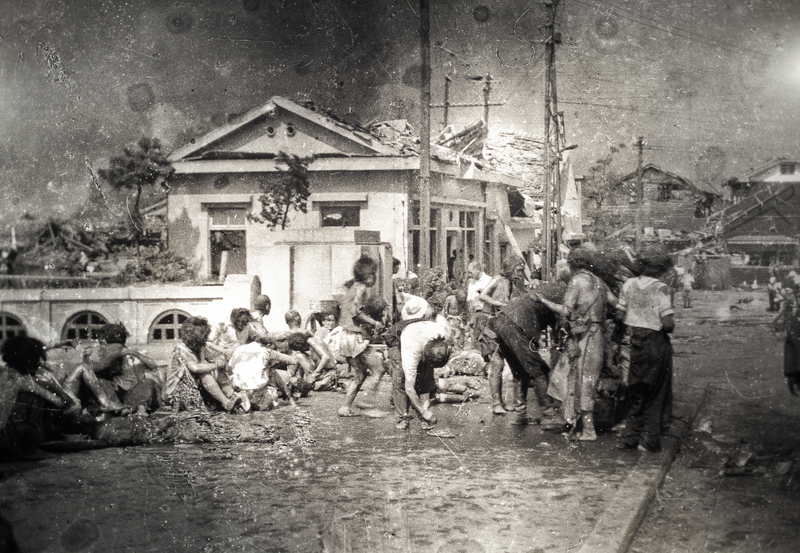 Japanese photographers, on the other hand, were concentrating on victims on the ground in photos that would not be published anywhere for years or decades (and many still not seen outside Japan to this day). Meanwhile, photos of survivors (many of them about to die) taken by both U.S. journalists and military and Japanese cameramen were banned everywhere. The great Alfred Eisenstadt took this photo for LIFE magazine but it was not published. Today a current gallery at LIFE presents 18 of their pictures of victims of the bombings, noting in their intro that “most” were never published--actually, almost none were. In a second gallery, they admit that “none” of those photos taken in 1945-46 were published. One has to ask: why not? U.S. military photographers documented the scene but haunting photos would be kept hidden. For example (left), the flash of the bomb incinerating a citizen but leaving his shadow behind forever. 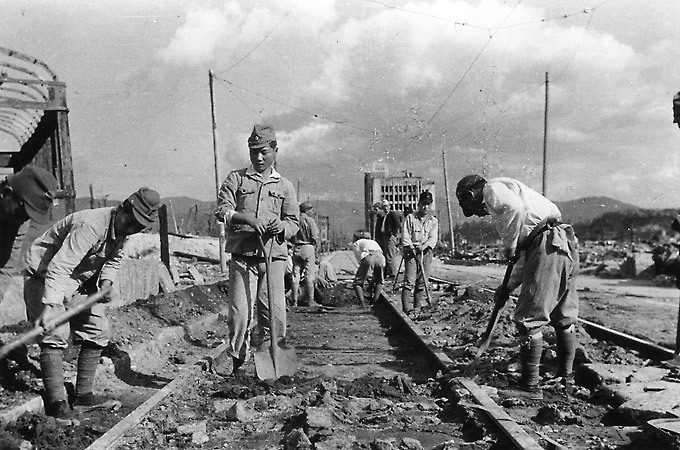 Meanwhile, a leading Japanese newsreel team had been shooting footage in the two atomic cities almost from the beginning. The U.S. military seized it and suppressed it for more than 20 years. In the late-1960s an American director made a 15-minute short from the footage that would be shown on some public TV stations in the U.S., offering most Americans their first view of the human effects of the bomb. But no one has made use of the more than two hours of additional footage since. Early in 1946, an elite U.S. military film team arrived and shot the first and only color footage of the aftermath of the bombing. Much of its showed the human toll and terrible and lasting effects on civilians. The director and one of the top aides hoped to make a film out of the footage warning the world of the nuclear peril but the footage would be classified for decades and only emerge in the 1980s. 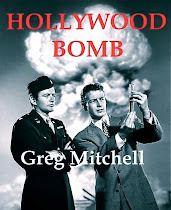 Also in 1946, atomic scientists urged MGM to make a big-budget Hollywood drama fully exposing what happened in the atomic cities and warning about making bigger bombs. MGM agreed, then changed course under pressure from the Pentagon--and even rewrote scenes after complaints from the White House. What emerged was a tribute to nuclear power. The next Hollywood film on the subject, in the 1950s, “Above and Beyond,” took a similarly positive view of the bombings. Nothing appeared on U.S. television for decades challenging the official story on Hiroshima. 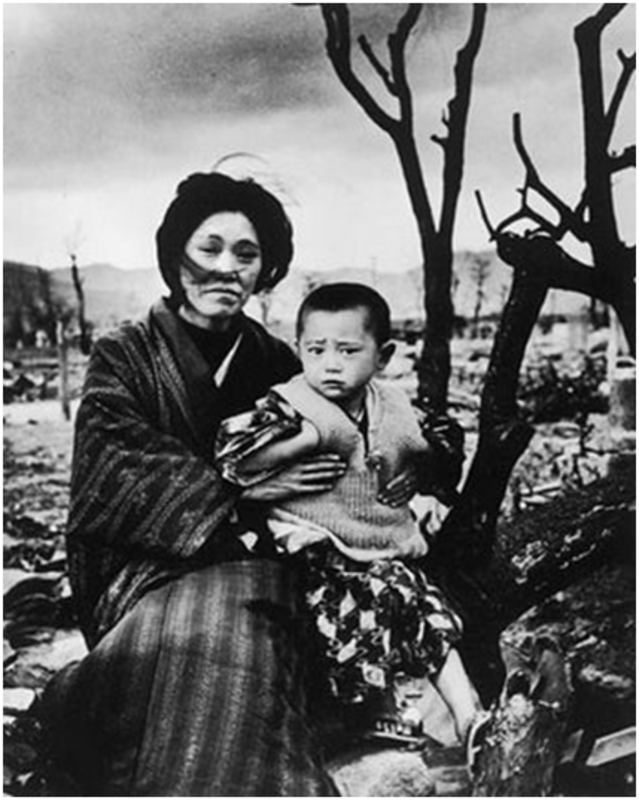 In 1952, LIFE magazine finally published the only photos taken in Hiroshima on the day of the bomb, by a Japanese newspaper photographer. One of the shots would become widely-published over the years--but it showed citizens, at a distance from the bombing, terrified but seemingly not bad injured. This misleading picture made the image acceptable in the USA. 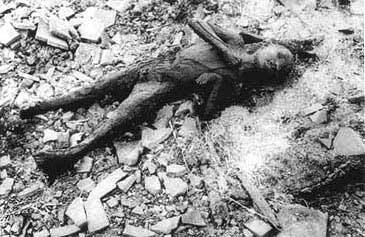 Below that is a photo from Nagasaki taken the day after the bombing there that was never been published in the USA. Hollywood produced some fine dramas that focused on current nuclear dangers (such as "Fail Safe" and "Dr. Strangelove") while completely ignoring how the Bomb had already been used against civilians. Although it was not a “documentary,” and focused on modern day UK and not Japan, Peter Watkins’ landmark “The War Game” in 1965 brought what might be called “Hiroshima imagery” to millions via TV and in movie theaters. Still, the footage actually shot in the atomic cities in 1945 was kept hidden. See my book on all the above, Atomic Cover-up. The 50th anniversary in 1995 inspired massive coverage but again the focus was on the decisions to build and drop the bomb, the Manhattan Project, the physical destruction of the bombs and psychological effects on the world of entering the nuclear age. We met many survivors of the bombing who told their stories in words but again we saw very images of what they actually experienced in 1945 and during their recoveries. There was much accounting on the costly nuclear arms race since 1945 but not probing of what a full airing of the atomic bombings effects might have slowed or halted that. In the U.S. there was exactly one TV special that challenged the common view that the bombings were absolutely necessary, hosted by Peter Jennings on ABC, and he was widely criticized for this. A balanced exhibit at the Air & Space Museum in Washington, D.C. was turned into a glorification of the bombings after protests. Here’s the Newsweek cover--again, just the mushroom cloud. The article, by the way, fully supported use of the bomb. 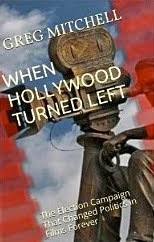 Note: I've written three books on the subject: Hiroshima in America (with Robert Jay Lifton), Atomic Cover-Up (on the decades-long suppression of shocking film shot in the atomic cities by the U.S. military), and Hollywood Bomb (the wild story of how an MGM 1947 drama was censored by the military and Truman himself). The government in classifying what happened at Hiroshima was fearful that the American people would not understand . This was necessary since government schools may have not made a passing grade in their indoctrination role. 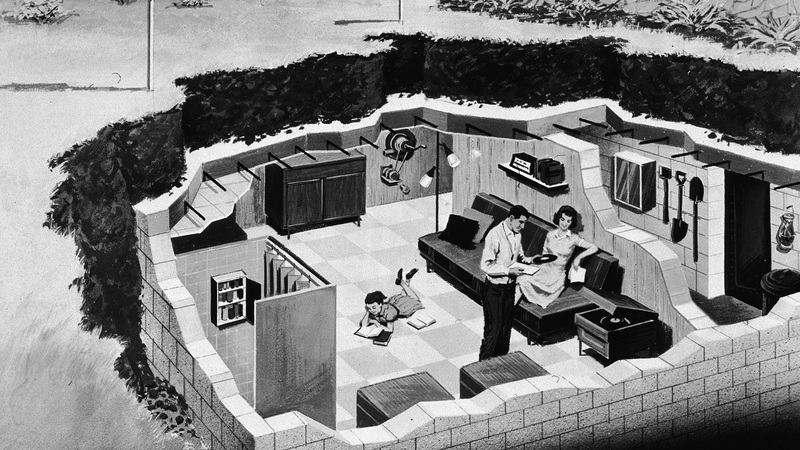 Then the Pentagon pressured MGM from making a melodrama about the bombed cities and the insanity of bigger nuclear bombs. Instead, nuclear power was promoted. Thus we made an ignorant Faustian bargain relating to nuclear power and nuclear weapons. Or at least the government made the decision for our own good. Just reinforces Ronald Reagan’s admonition that the nine most terrifying words in the English language are I’m from the government and I’m here to help. IT is not government that is the issue, for government is only a concept or concepts. It is the people in and running the government that are the problem, and also what pushes these people in government to do such. IT is like, a gun in it's self is only material, but put in human hands, and it's a danger. A nazi uniform is simply a collection of material and metals. But put a person in it with to much obedience to authority, and the authority lacking ethics, morality, and empathy (or suppressing it, either way the same end) and then you have a bad uniform, a bad and dangerous military even to it's own people. This type of cover up is not uncommon, it is a shame that people do such acts, such evil and then can cover it up. And maybe some of the cover up was for profits, because the energy and money that could be made off nuclear power..Maybe, maybe they didn't have a clue about i then, but I doubt it I think some knew even then. Guess the Japanese could not imagine what was coming their way when they snuck up and slaughtered those at Pearl Harbor. Of course the bomb was only a dream at that time... but necessity is truly the mother of invention... and we invented a way to stop them. Of course... many in the world were working on the same thing. I for one will not forget what the Japanese army was doing to others in their attempt to take over the world. They were put in their place... and unfortunately, there are always innocents that pay the price too... on both sides. 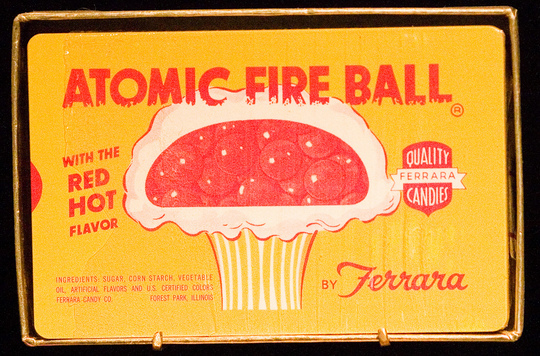 I am elated that atomic weapons have not been dropped since. The world understands the consequences if we dare go there again. Cover ups... I don't waste my time on them... I did not need to see pictures to know what took place beneath that mushroom cloud. I am not a fan of government. I think our history following the initial use of atomic weapons on Japan is seriously flawed. I have been antiwar since my youth. But I think WW2 is different. I believe that the use of the bomb to end the war was probably justified. This dramatic report seems to ignore the activities of the Japanese military and government in that war including their use of biological weapons on the chinese. There was horrible death and distruction due to civilian bombing throughout the war in Europe and Japan. Consider the indiscriminant firebombing of many cities on both fronts with massive casualties. My father was on okinowa when the bombs were dropped. He was likely to be one of the million casulties expected when we would have to invade the mainland of Japan since they were unwilling to surrender. I have a problem with revisionist history. Why no mention that the Japanese military refused any possibility to negotiate and end to the Pacific War? They were beaten, and they knew it. But they were fanatical and vowed to slaughter any allied troops that dared set foot on the Japanese mainland. They described US soldiers as savages, rapists, and pillagers whose intent was the destruction of Japan and all it's people. The population was ready to fight to the death with any improvised weapons. It's estimated that allied casualties could have approached a million or more if Japan were invaded. 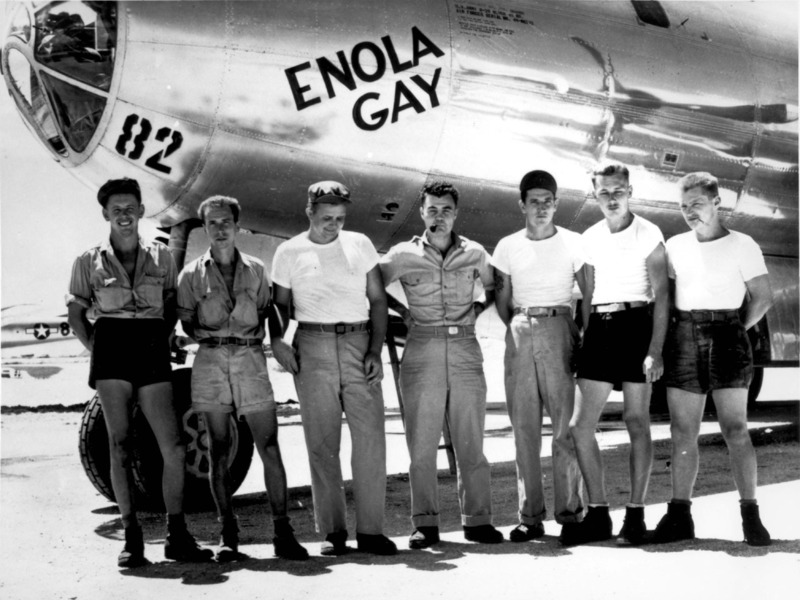 So, horrible or not, the atomic bombs dropped on Japan conclusively ended WWII. The consequences are terrible, but the blame must be borne more by the Japanese military and political leadership than by the US and its allies. That no further nuclear weapons have been used since is a testament to the destructive power and lasting effects of their use. Hiroshima and Nagasaki were lessons that had to be learned. Hopefully they will not be forgotten. It's now come out that the real reason they got the go ahead to drop the bomb was to scare the Ruskies. It's about time this came out. 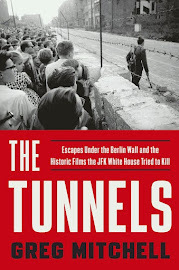 People, like Charles Pellegrino who wrote the excellent book the Last Train from Hiroshima, have been silenced for talking about what happened to the people at ground zero. All because the military simply didn't want people to know some of the horrible things that the Japanese people suffered due to the bombings. Thanks for writing about this. It's really good to see that this footage is finally getting out there for more people to be made aware of it. To the individual that said the bomb was dropped to scare the Russians, read a history book for a change. The Russians were our allies and declared war on Japan as part of their promise to do so once the Nazi's had been dealt with. Concerning the horrific nature atomic attacks, the ugly truth is that casualties produced were less than the nightly firebomb raids that B-29s were conducting for instance again Tokyo. The nuclear option was used to force the Japanese to surrender so an invasion would not be necessary. The number of casualties (both American and Japanese) projected were in the millions if an invasion of the Japanese home islands had been attempted. Estimates were that sufficient Japanese troops, ammunition and suicide aircraft were available to produce a guerrilla war lasting 20 years. If you don't believe those projections, check and see when the US military last bought Purple Heart medals. The purchase made in anticipation of Operation Olympic (Japanese invasion)casualties has been sufficient to cover all American awards for Korea, Vietnam and to date. I am not sure which American General said that war is hell, perhaps it was McArthur, but anyhow it is true. It is also true that ultimately it is the people of a society that bear the responsibility for the acts their governments take. 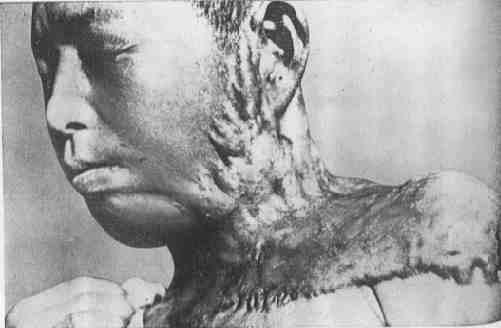 While we are examining our role in the destruction of so many civilians in Japan, let us not forget that many millions of citizens of other countries were murdered and enslaved by the Japanese, in the name of the Japanese people. It is so satisfying to see the complete effect of public school indoctrination on some of the posters here. It's not just the schools, it's government influence as a whole, aided and abetted by media and a Hollywood system that, while attacked for liberal degradation, actually serve as useful idiots and propaganda tools for an establishment, a defense industry, turning the screws behind the government, perpetuating a narrative that keeps Congress in their pockets and citizens apathetic and disconnected. Such trite rationalizations expressed here, such as "we had to because they wouldn't surrender..." or "well, look at how they conducted atrocities..." are nothing more than pathetic platitudes meant built on points in time without context to a passage of time, intended to alleviate an intellectual or emotional engagement of this vicious slaughter and holocaust of hundreds of thousands of lives. 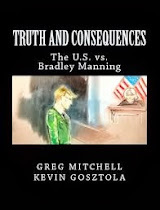 Granted, there may some truth to these rationalizations at those points in time, but it is outweighed by convenient ignorance that there is a longer chain of events that must be considered, that the provocations and political sorcery leading up to events leave the "truth" held by these posters begging for justice. Japan was ruthless and immoral, yes, and they were willing to sacrifice much to preserve honor. The Japanese were also baited into WWII, manipulated by an American administration absolutely hell bent to enter the war but unable to do so without the ultimate provocation. These are my assertions, yes, but they are easily corroborated and supported by reams of historical documentation (I like how one poster expresses a dislike for "revisionist" history, which is code-speak for a dislike for actual historical truth when it is too difficult to reconcile with an ideologically clouded vision). Of course America has hidden this film archive from the public for decades. The American public prefers to live in denial of the truth and degree of atrocities committed over the course of its proud history because it does not conform to the belief in an exceptionalism which serves as the pillar of the catastrophic foreign policy most still justify today. For too many, it's better to live with heads in the sand than to come clean and fess up to a dirty history juxtapositioned against an unprecedentedly glorious history. It's better to pervert and sanitize our history to save room for the atrocities to come than to face the shame and use it as the ultimate reason to say "no more." Yes it is terrible to watch. 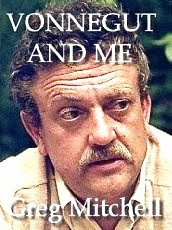 However, it was necessary. The Japanese would have never surrendered. The war would have gone on with greater loss of American and Japanese lives. Sadly, I consider myself a survivor of Hiroshima. My Father was preparing for invasion on Okinawa when the war ended. Reading the article and subsequent comments, I wonder how many people really give some thought to a possibility if terrorist organization get their hands on a nuclear device they would hesitate one minute to use it on the US. But we continue dealing with that trash with the "due respect" that took us 2000 years to develop. I wonder if we will awake in time or not awake at all. I remember the air raid drills, the sirens blaring across the city ... standing with others in a dark corridor ... the strontium 90 counts. Those were the days, my friend, we thought they'd never end.